In the context of World Day for Safety and Health at Work last week, Dubai Municipality teamed up with Doka Gulf FZE to present new safety innovations in formwork systems which comprehensively address all aspects of material quality and construction jobsite safety. 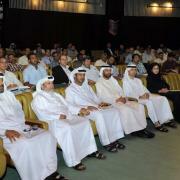 The event, held at City Hall Dubai Municipality on May 1, 2012, was entitled “360 Degree Formwork Safety Symposium”. Presenters were Gerald Hoermann, Regional Technical Manager, Doka Middle East and Alexander Macho, Technical Manager, Doka Gulf FZE. Essa Al Maidour, Assistant Director General for Engineering and Planning Sector at Dubai Municipality, Mohammed Noor Mashroom, Director of General Projects and number of senior officials as well as representatives of contracting and consulting companies have attended the symposium. Essa Al Maidour said, the municipality is keen to cooperate with the entities working in the field of construction safety, as its Accreditation Department has approved and authorized around 35 entities to ensure the safety of construction sites throughout the emirate of Dubai. He commended the joint safety symposium initiative with Doka as a leading example of corporate social responsibility to vigilance in all aspects, including formwork safety, on sites. Doka, the leading Austrian firm, who develops, manufactures and distributes formwork technology for use in all areas of cast-in-place concrete construction, presented topics extremely relevant to today’s construction sites in Dubai. Civic body officials, contractors and consultants listened attentively as Doka introduced the methods for successful deployment of load-bearing systems, wall and floor-slab formwork, and the Doka systems which comprehensively address the highest European safety and quality standards. Doka further encouraged contractors to engage with a reliable full-line partner who can offer formwork service expertise such as site-supervision and training throughout the entire project cycle. The most interesting part of the program was the discussion on building safely at heights, especially when wind and visibility are a regular factor in the Middle East. A short case study on the successful completion of Dubai’s Burj Khalifa, the tallest building in the world, completed on time and with zero accidents using Doka systems as an industry leading example. The successful event drew over 100 delegates and was conducted as a part of Dubai Municipality’s continuous and ongoing educational initiatives. Thank you for your interest - DM and Doka Host Formwork Safety Symposium. Thank you very much for your interest - DM and Doka Host Formwork Safety Symposium.